Posted on 01/13/2018 , updated on 01/26/2018 by KWLS Admin. “We didn’t have a title for our talk because we like to be free,” stated writer and photographer Teju Cole at the opening of the self-proclaimed “barbershop talk” Friday morning. 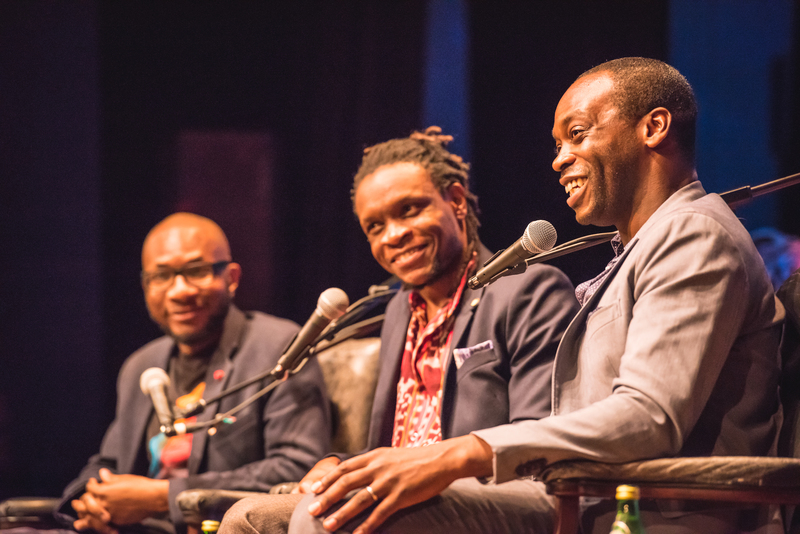 Along with poet and editor Ishion Hutchinson, and poet, essayist, and translator Rowan Ricardo Phillips, the three went on to have a fluid conversation punctuated by sharp observations, endearing ribbing, and even poem dedications. In other words, the three were more than colleagues discussing the state of the Caribbean and identity today—they were close friends. Cole served as moderator, opening up the discussion by interrogating the notion of antecedents or influences, a motif that has popped up again and again during this year’s seminar. He then challenged Phillips to name his top four or five influences. (In Phillips’ own talk “I Who Have No Weapon But Poetry” earlier in the morning, he admitted “I don’t like to be fixed, and I always avoid the question ‘who are your influences. '”) However, in the end, he did give a few names: Wallace Stevens, Derek Walcott, Dante, and Federico García Lorca. Hutchinson added to the layers of the conversation, stating “for me, the names of my influences change daily,” and Cole joked “when I look at my list of influences now, it’s all old men [such as W.G. Sebald and John Berger] . But we don’t choose our parents or grandparents.” The panelists also discussed the difficulty of capturing a place, and how literature can be a means of discovery. Cole used the example of reading Phillips’ poem entitled “Stockholm” when he was in Stockholm, and how it created a new entry point of understanding. And, according to Cole, “you need to write somewhere beyond the high C pitch, beyond human hearing.” Striving to shatter perfection, they all seemed to agree, was a noble and necessary cause. Dana De Greff is an MFA candidate in fiction from the University of Miami. She has published poems, short stories, and book reviews in PANK, The Miami Rail, Origins Journal, and others. She is the current Literary Artist-in-Residence at The Deering Estate in Miami and is at work on her first novel. Would love to see Rowan in next year’s lineup on archetypes to talk about the influence of Dante….